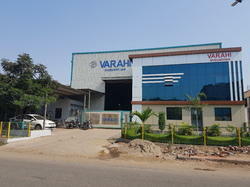 Varahi Industries has seen exponential growth since its inception in 2010. We are operating as the manufacturer and supplier of a wide gamut of Powder Processing Machineries. Our product range is comprehensive and is inclusive of Continues Ball Mills, Ice Crushers and Air Classifiers. These products are highly regarded for being durable, ideal for heavy duty usage, sturdily built, resistant to abrasion and easy to maintain. We offer after sales services for the maintenance of the machines as well. Our manufacturing unit is well-equipped with innovative machines for making superior grade of products. We source our raw materials from highly a reputed vendor base for maintaining the industrial standards and the prevalent market trends. The product range is remarkable in terms of quality as it is subjected to stringent parameters of quality control which are highly appreciated by our clients. Our warehouse is systematic and free from dust and moisture. It helps in avoiding confusion during packaging and dispatch. The transportation network is effective, fast and reliable. It has enabled us to deliver products within the mutually agreed time period. We are a trusted name in the industry owing to the dedication and commitment shown by our group of professionals. Our team comprises of HR professionals, engineers, technicians, quality controllers, warehouse personnel, packaging experts, transportation personnel and sales executives. Our clientele is wide and comprises of reputed names. Our mentors, Mr. D.G. Sharma and K.D. Sharma, are our constant source of inspiration. They have a wide knowledge base and immense experience in this domain. Their sharp business acumen has taken the firm to peaks of success. Our mission is to provide VALUE FOR PRODUCT by establish trustworthy long-term relations with customer, supplier and employs. As well as Deliver intimate quality product and service to customers. Varahi Industries is formed to serving various machineries for particle and powder processing machinery. We started this company since 11 years at Vatva GIDC, Ahmedabad after having more than 25 years of experience on other name. We are serving needs of industries like chemicals, Dyes, Bulk Drugs, Colours, Pigments, intermediates, Agrochemicals, Agricultures, foods and Minerals. So our machineries are useful to Chemical and Pharmaceutical Industries. We are manufacturing most reliable Powder Processing Machineries. Varahi Industries also has expertise in providing machineries customized. The satisfaction of our clientele is the primary aim of our firm. Our products are highly regarded for their exceptional performance and sturdy built owing to the sincere efforts of our dexterous engineers and technicians. We employ stringent parameters of quality control for ensuring the delivery of best possible products to the customers. Our quality control unit is loaded with sophisticated equipment for testing these products on multiple parameters. We operate as a customer-oriented organization and manufacture products in compliance with the prevalent market trends and the industrial standards. Our sole aim is to make customer-oriented products, which decrease the downtime of processing substances and increases the productivity in various industries. This approach has made us a highly renowned organization with a huge client base. Our product range is wide and ideal for pharmaceuticals, chemicals, minerals and ores, food processing and fertilizers industries. The firm is renowned for meeting the clients’ requirements effectively and the products are remarkable in terms of design and durability. We constantly indulge in research activities for offering latest range of products. Our vision is to always develop & produce reliable, high-quality product by keeping low price by providing fair price by alternative to our buyers. Our desire is to start a good and long lasting business relationship with your esteemed organization and assuring you our widely appreciated services and technical support to realize you for buying machine from us and from others. We promise our integrity and loyalty & our best efforts for the services, technical support and trust. We achieve our goal and help to be success our customer by our well experience team. Our company is headed and guided by following top authorities having expertise in respective area. Our workforce is diligent and has earned us a sterling reputation. The team consists of administrators, engineers, warehouse personnel, quality controllers, sales personnel and transportation personnel. All the members work in close coordination and are experts in their respective roles and responsibilities. We organize different workshops and training sessions for keeping our professionals abreast of the latest trends and techniques. Their dedication towards our firm has enabled us to handle bulk orders promptly and efficiently.